By Michelle Sanborn, NH Community Rights NetworkEversource recently appealed to New Hampshire’s Supreme Court, contesting the Site Evaluation Committee’s (SEC) denial of Northern Pass. This appeal was expected by those in the NH community rights movement because when corporations don’t get the answers they want, they challenge the decision-making system, with only required consideration for the wishes of people affected by a proposed project. So, what happens when regulatory bodies like the SEC do in fact stall facilitation of a corporate permit? They are often intimidated by corporate developers who turn to bullying tactics, including using the courts in an attempt to overturn permit denials. And history and experience show that these bullying tactics will result in the court ruling in favor of the corporation, thereby legislating from the bench on behalf of Eversource. By embarking on this path, Eversource has demonstrated its willingness to continue ignoring the wishes of the people, and to dig into its pockets to override the SEC, an agency created by the legislature. Clearly, at every juncture, Eversource has shown it doesn’t care about the voices of New Hampshire community members. What can people do in response? Firstly, we can recognize that we have 1) the inherent and inalienable right to protect our pursuit of life and protect our properties and 2) the moral responsibility to protect both local ecosystems and economies. Secondly, we can exercise this right and responsibility by way of adopting rights-based ordinances (RBOs). Almost a dozen NH communities have done just this to address proposed corporate harm. According to NH Bill of Rights Article 10, these RBOs reform our government, rewriting our social contract with the corporate-state by protecting our human communities and ecosystems when our government is not doing so as NH Bill of Rights Article 3 says it must. And by elevating rights of people and ecosystems above the ‘rights’ of corporations, these RBOs signal that business and corporations are welcome in New Hampshire communities, but only if they are innovative enough to recognize the need for this paradigm shift. Residents up and down New Hampshire understand the need for local governing authority by way of RBOs, and they’ve given rise to a people’s movement calling for a state constitutional amendment to more clearly recognize the people’s right to self-govern for the protection of our human and natural communities’ health, safety, and welfare. The resulting NH Community Rights Amendment earned 1/3 of the New Hampshire House’s support in 2018 and will be back again. Visit www.nhcommunityrights.org or email info@nhcommunityrights.org to learn more. New PFC law in NH: potentially dangerous? A year ago, I was a NH parent worried about how to address our statewide problem with PFCs—persistent synthetic chemicals that don’t leave the environment or our bodies and that are especially consequential for those in utero, like the child I am carrying. A year ago, I would have lauded Governor Sununu for signing into law a pathway for lowering PFC standards to reduce NH water contamination. But I’ve evolved from concerned parent to community rights activist. Today I see the law as a potentially dangerous lateral move toward complacency. Before I continue, the mothers of Testing for Pease and Greenland SafeWater Action — and NH Representative and now NH Congressional candidate Mindi Messmer — deserve copious praise for making NH’s PFC issue so public and officially recognized. My criticism is not for these tireless advocates, but for our institutionalized minds. We’re conditioned to celebrate lowered levels of toxic chemicals even when we know that no amount is good for us. To be fair, I’ve heard NHDES scientists genuinely concerned about PFCs state the impracticality of setting a zero standard because of the ubiquitous nature of PFCs. I respectfully can’t accept this. The CDC just reported that NH has the nation’s highest rate of pediatric cancer. Our children are being poisoned and dying. We must go beyond standards and reductions to elevate people’s and ecosystems’ rights by wholly preventing future contamination by disallowing it. Problematically, NH and its permitting agencies abide by a regulatory system standardizing “safe” chemical levels, thereby legalizing the claimed “right” of corporations to harm us, favoring corporate profit and toxic consumer choice over health of people and planet. I believe we rely on this system because we’re not awoken with outrage that we have such little democratic pathway to directly protect ourselves in a state functioning under Dillon’s Rule, meaning that NH is the parent and its municipalities are the children who must obey even if the parent allows harm to come to them. Enter community rights, a people’s movement of rights-based ordinances. RBOs are local laws NH residents adopt to protect themselves and their ecosystems from corporate harm while not limiting already protected state and federal rights of individuals. Since 2006, RBOs have been adopted in NH towns by individual residents collectively exercising their right to vote yes or no in a town vote on the RBO. Residents adopting and enforcing RBOs reference a number of NH Bill of Rights Articles, namely Article 1 — all government of right originates from the people, is founded in their consent, and instituted for the general good; and Article 10 — people have the right and duty to reform governments when those governments manifestly endanger public liberty. This year, a people’s movement of supporters brought forth the NH Community Rights Amendment to recognize and secure the right of NH residents to adopt RBOs, so long as they always expand, not limit, established rights of NH residents. As a constitutional amendment, it needs 2/3 the NH people’s vote, but we can’t cast this vote unless our legislators allow us to by giving the amendment at least 3/5 support in both House and Senate. This year it earned 1/3 House support and will be back. You can learn more from the NH Community Rights Network, a statewide, grassroots non-profit that informs citizens and legislators about their inalienable right to local self-government. In the meantime, NH towns continue adopting and organizing RBOs, including my town where I co-founded Alliance for Newmarket Citizen & Ecosystem Rights. We’re so new we’ve yet to make a website or Facebook page, but we invite you to these upcoming public events. Monday July 30, from 7 to 9 p.m., ANCER will host an all-ages fundraiser at Newmarket’s Stone Church, with a brief informational presentation between two sets by local blue-grass duo Green Heron. $5 suggested door donation. Friday, Aug. 17 from 6 to 9 p.m. and Saturday, Aug. 18 from 9 a.m. to 5 p.m., ANCER will host Daniel Pennock Democracy School at The Loft in the Newmarket Mills. Given by the nonprofit, public interest Community Environmental Legal Defense Fund, Democracy School explores how corporations have hijacked democracy and how NH residents can push back against legalized unsustainable activities that violate the rights of residents, our communities, and nature. Registration is due Aug. 10 on a sliding scale: $30-$50 (scholarships available). Please email monica.christofili@gmail.com for more information. Inalienable rights are the rights that all people are born with through the understanding God or our Creator endowed us with. This right and taking this knowledge explains and defines the word of personhood and the meaning of person and personification confirmed in the truth that all of humankind were created equal under the law of right, human rights. It should be said of course, We the People are all persons, but then to apply that concept that a corporation has personhood, personhood is applied to the plural of persons individual in the corporation. Corporation on the other hand is not a God given right but is man-made and it is unseemly to give the power of individual to a plural separate from the whole of individual citizens. The “Bill of Rights” was written for the protection of the rights of a sovereign individual or state, not a special class of men unified against the whole affording special privilege. Quoting “a house divided against itself will fall,” not maybe. Putting all this aside, now ponder what is an authoritarian structure of rule. This comes by the contractual agreement not through the usurpation of inalienable rights pretext to all human rights and rights amended to the Constitution. The Supreme Court decision of 1886, State of California vs. Southern Pacific Railroad created a ruling to a civil law suit in the structuring of language to argue a suite of back taxes on fences that the State of California was seeking to recover from the Southern Union Pacific Corporation. In this case, Article 14 from the U.S. Bill of Rights was used to grant the corporation personhood rights. There was dissent amongst the justices of the 9th district court taking Article 14 that was written to amend Article 13, the rights of freed slaves to uphold the protection of property rights of a disenfranchised people but it was Justice Waite presiding on the district court who stated, “we all agree in this court that corporations are guaranteed the property right written in the 14th Amendment” and was never opened to discussion or debate. Ever since that time corporate law has empowered itself with private property rights that followed many other corporate privileges like state pre-emption and Dillon’s Rule. Corporations now have equal standing with the power of the state. We the People stand to lose in civil suits in the judicial court to protect ourselves from corporate projects that harm and undermine our rights as a collective body politic of our municipalities in which we live. Since 2006, starting with Barnstead’s first-in-the-nation Water Rights & Self-Government local law, a growing number of New Hampshire communities have pushed back with rights-based ordinances (RBOs) affirming their inalienable right to self-govern and calling for state constitutional change recognizing local authority to afford greater protections for people and planet where higher government is not doing so. Almost a dozen communities have adopted RBOs, elevating the rights of people and natural environments above corporate claimed “rights” to harm them and use them as resource colonies for profit. Corporate lobbyists are still seeking to press their corporate privilege against the people for their own profit, backed by a contingent of representatives and senators of an authoritarian ideal of state control over our municipalities. They exert this control by passing bills that infringe upon our sovereign rights as peoples of community, whittling away to create the path for corporate rights over real people — otherwise called the corporate-state. We the people can’t remain stolid with a laissez-faire attitude. People are needed and to be heard in a civil exchange of ideas that are not innovative but are based on the original principal foundations of our governing body from the American Revolution In New Hampshire we say, “live free or die.” This is not brutish reasoning, it is transcendental. To understand more about these issues and how to legalize a sustainable vision for your community contact the NHCRN at info@nhcommunityrights.org and visitwww.nhcommunityrights.org. NHCRN is non-profit-volunteer organization educating communities and electeds in how to protect our right to self-determination, empowering them with authority to legalize the vision they have, free from private corporate controls and government overreach. JOIN NHCRN in SUPPORTING ANCER's RBO EFFORT ​FOR GREAT BAY! ​The NH Community Rights Network is glad to support ANCER's gathering to educate Great Bay towns regarding the resident-proposed Newmarket Freedom From Chemical Trespass RBO. Join us to learn how NH residents are using local democracy to manifest the visions they have for economic, social, and environmental justice. Donations gladly accepted to support ANCER's outreach costs. Contact gstraquair@yahoo.com or send cash or check to ANCER member Glen Traquair, 156A Exeter Road, Newmarket NH, 03857. ANCER's purpose is to educate and organize towns in the area of the Great Bay Estuary regarding their rights in the face of laws that allow unsustainable projects to go forward in our communities. Currently, Durham, Newington, and Newmarket residents are facing effects of Eversource's Seacoast Reliability Project dredging and/or drilling an energy corridor through the Great Bay Estuary's Little Bay, with the potential to stir up 100 year old toxins embedded in the silt. In response, Newmarket residents are organizing around their right to democratically adopt a Newmarket Freedom from Chemical Trespass Rights-Based Ordinance based on their inalienable right and the right of nature to protect their health, safety, and well-being. ANCER hopes that fellow Great Bay area residents--once empowered to raise their voices to declare what kind of social and environmental justice they stand behind--will choose to adopt community rights-based ordinances to elevate their and their ecosystems' rights above the claimed 'rights' of corporations. The Newmarket Freedom From Chemical Trespass RBO, a.k.a. "A Rights-Based Ordinance for the Great Bay", would extend protections for Newmarket’s people and natural environments beyond those protections currently in place at the state and federal level. It would make it illegal for corporations to contaminate Newmarket’s watershed, including into the Great Bay Estuary, which would include Eversource’s Seacoast Reliability project crossing through Little Bay. ANCER is also hosting a Tuesday, June 26th, 6-8pm (NOTE: library is making this space available after hours) public informational event at Newmarket's library to inform fellow Newmarket residents about how little local democratic freedom the town's residents actually have to cast votes in order to make decisions about their vision for the safety and well-being of themselves and their surrounding ecosystems--and to discuss what they can do about this. ANCER members' first hand experience of the suppression of local democracy has inspired their continued support of the NH Community Rights Amendment to recognize the need to empower people in their communities with the authority to enact local, common sense laws to protect their economic, social, and environmental well-being from corporate harm. CALL TO ACTION - TRUST BUT VERIFY! REACH OUT TO YOUR TOWN MODERATOR ASKING THEM TO COMMIT TO PROTECT THE PEOPLE'S VOTES BY SUPPORTING VERIFICATION HAND COUNTS OF ELECTRONIC DEVICE-COUNTED BALLOTS. This legislative session, NHCRN helped educate legislators on HB1582, the Trust But Verify bill, which would have provided an opportunity for moderators to assure both themselves and voters of the accuracy of their town's electronic ballot counts. HB1582 proposed to clarify moderators' authority to randomly and openly conduct a verification count of electronic ballot-counting devices--after polls close, but prior to attesting to the accuracy of the vote--thereby giving them a method to comply with the duties they take an oath to uphold in both Part 2, Art. 32 of NH's Constitution and in state law. The NH Secretary of State opposed this measure saying it would lead to a lack of confidence in the voting systems used in the Granite State. The Secretary of State is now requesting input on our elections. He has set up a number of Round Table discussions for Town Moderators. "We would like to hear your viewpoint on attempts to require hand counts of certain races on the ballot after the polls close on election night. Do you feel there is a need for such a check on these machines?" Conctact your Town Moderators, educate them on why a verification hand count is needed, and ask them to speak out for it at their Round Table. Educate your town Moderator with the TRUST BUT VERIFY FAQ. Wed June 20 in Gorham Town Hall at 10 a.m.
Thurs June 21 at 2 pm in Keene, Blastos Community Room, Police Dept. I am the Town Moderator of Derry. I’m writing to give you some background on a question posed by the Secretary of State in an email to Moderators dated June 1. The Secretary asked for our viewpoint on requiring hand counts of certain races on the ballot after the polls close on election night. I believe he is referring to HB 1582. This bill allowed but did NOT require moderators to verify the machine count after an election. If the moderator decided to do so, the bill outlined a process for doing so. Please read the full bill for further background. I am very concerned that the Accu-vote program we use, in fact, any software can be hacked by a determined and patient hacker. I am not alone in this conclusion. Over 100 cybersecurity and computer programming experts have testified to the vulnerability of these ballot counting devices to malfunction or tampering even when the voting machine is physically disconnected from the internet. Earlier this year, the U.S. Congress allocated millions of dollars to be distributed among the states to upgrade to a paper ballot system AND to develop a means of auditing the elections results. But HB 1582 was not designed to require a post-election audit. It’s primary purpose was to restore to moderators the authority which I believe is plainly stated in statute to verify the accuracy of the count. Doing selected hand counts has been used by several moderators over the years when they wanted a check on the machine results. Until September 2016, the Election Procedures Manual (EPM) stated: “Moderators may use their discretion as to whether or not they will conduct such a (verification) count on election night.” (pg 40 2014-2015 EPM). This sentence was removed without any explanation in the 2016-17 EPM distributed in October, 2016. Whether you trust the machine count or not, I hope you will support the right of town moderators, at their discretion, to verify the machine count before certifying the final results. In the final analysis, this is a local control issue. Over the past several years, the SoS has been chipping away at the authority moderators to conduct elections in their own district. This is just one more chip. If for any reason you were not sure of a vote results, wouldn’t you like the authority to publicly recount the votes without having to get permission from the SoS? Please join me in asking the Secretary to restore the instructions allowing moderators, at their own discretion, to assure both themselves and voters of the accuracy of their town's electronic ballot counts. By the way, in September, 2016, I conducted a verification count similar to the one described in HB 1582. I brought in 4 fresh teams of counters and completed the task in less than one hour, using ballots from one of the 6 machines we use in Derry. Of course, I was roundly reprimanded by the Secretary for doing so. How many people are paying attention to the 2018 elections? This November could be a turning point for our state, nation, and planet, so voters better get involved! We need to elect new State Representatives who work for our communities and our rights! Over 100 Legislators voted this spring for CACR 19, the Community Rights Amendment, to give our towns the right to pass ordinances that protect our citizens and environment from unwanted, dangerous, and destructive development. Unfortunately many more opposed CACR 19 in order to protect greed-driven special interests that hurt our towns. There will be Congressional elections as well as an election for governor, and you know that corporate PACs (political action committees) will bribe our candidates with legal (but immoral) campaign contributions. If they take PAC bribes, then we should vote them out. We have the best politicians money can buy, but We the People can change that! All politics are local, so we need to get organized town by town and in our cities. You may contact the NH Community Rights Network (nhcommunityrights.org) to get assistance with local efforts that protect the health, safety, and welfare of people and nature. Please do your civic duty and support candidates who put our towns and cities and Nation ahead of greedy special interests; do it for our Country, do if for our children, do it for Mother Nature and planet Earth! Educating and empowering communities and elected officials about our individual and collective right of local self-governance in order to secure and protect the inherent and unalienable rights of all inhabitants of New Hampshire to economic, social and environmental justice, including the rights of nature. Join, Like, & Share NHCRN on Facebook! Your DONATION serves to protect New Hampshire's human and natural communities from social, economic, and environmental injustice. Consider becoming a sustaining NHCRN supporter today. Your monthly donation will ensure the vitality and growth of NH's Community Rights and Rights of Nature movement. NHCRN is a 501c3 grassroots non-profit dependent upon private donations and small grants from regional funders. If you feel NHCRN does not empower your community in a manner that inspires you to give, please reach out and share with us how we can do so. Email info@nhcommunityrights.org with your suggestions. A landmark legislative session was held this winter in NH. It marked the first time a Community Rights state constitutional amendment was debated and voted on by a state House of Representatives. The proposed amendment would recognize the authority of people in towns throughout the state to enact local rights-based laws protecting individual and communities’ rights, free from corporate interference and state preemption. That authority includes the right to protect the natural environment. The amendment did not receive the 3/5 super-majority vote required to advance a state constitutional amendment to the November ballot. This was not surprising, given that the full committee chair ignored the subcommittee recommendation’s “ought-to-pass.” He allowed a motion of “inexpedient-to-legislate” to stand and move to the House floor. Despite this, 1/3 of the New Hampshire House of Representatives demonstrated their support. These legislators recognize the inalienable right of people in their communities to protect themselves from corporations intent on using their communities as sacrifice zones. Community Rights supporters are encouraged both by the bipartisan support the people’s amendment received in the sub- committee, and the 112 House votes in favor of advancing the amendment to voters. Growing numbers of New Hampshire communities are forced to host parasitic special interest projects such as high voltage transmission lines, oil and gas infrastructure, water withdrawals for resale, landfills, and other harms. They face a structure of law and government that allows corporations to impose these harmful activities into their communities against the will of the people due to corporate claimed “rights” and privileges. In response, New Hampshire communities are partnering with the NH Community Rights Network (NHCRN) and Community Environmental Legal Defense Fund to advance their rights. They are drafting local Community Rights laws, or rights-based ordinances (RBOs). The RBOs elevate communities’ right of local community self-government and environmental rights to clean air, water, and soil, above corporate claimed “rights” and state preemption. Over the past decade nearly a dozen communities state-wide have adopted RBOs —not because they expected the New Hampshire legislature to agree with them, but because these rights are inherent and inalienable. The NH Community Rights Amendment would guarantee state protection for local RBOs. We know from prior people’s movements that fundamental change takes persistent, unrelenting pressure. As corporate threats grow in the Granite State, more communities are joining the Community Rights movement. These communities and their supporters will reintroduce the NH Community Rights Amendment because our quality of life — indeed our very lives and those of our children and future generations — depends on it. Members of Alliance for Newmarket Citizen & Ecosystem Rights (ANCER) made public comment to Newmarket's Town Council on the resident-proposed communityrights-based ordinance (RBO). The Newmarket Freedom From Chemical Trespass RBO, a.k.a. "A Rights-Based Ordinance for the Great Bay", would extend protections for Newmarket’s people and natural environments beyond those protections currently in place at the state and federal level. It would make it illegal for corporations to contaminate Newmarket’s watershed, including into the Great Bay Estuary, which would include Eversource’s Seacoast Reliability project crossing through Little Bay. ANCER also has plans to host a Tuesday, June 26th, 6-8pm public informational event at Newmarket's library to inform fellow Newmarket residents about how little local democratic freedom the town's residents actually have to cast votes in order to make decisions about their vision for the safety and well-being of themselves and their surrounding ecosystems--and to discuss what they can do about this. Bring a NHCRN Fundraiser to Your Community! NH folk trio Oak & Ivy recognizes that forwarding the community rights movement at both the local and state level requires funding. In light of this, they have extended an open invitatiion to NH communities to partner with them to put on shows to benefitNHCRN's work educating elected officials and communities about the right of local community self-government. If you'd like to bring an event like this to your town, please email monica@nhcommunityrights.org to find out how a NHCRN fundraiser show can be customized to fit your community's vision. Stay Connected — Join NHCRN on Facebook! This legislative session, NHCRN helped educate legislators on HB1582, theTrust But Verify bill, which would have enabled town Moderators to assure both themselves and voters of the accuracy of their town's electronic ballot counts. HB1582 proposed to do this by clarifying Moderators' authority to randomly and openly conduct a verification count of electronic ballot-counting devices after polls close but prior to attesting to the accuracy of the vote--thereby giving them a method to comply with the duties they take an oath to uphold in both Part 2, Article 32 of NH's Constitution and in state law. We would like to hear your viewpoint on attempts to require hand counts of certain races on the ballot after the polls close on election night. Do you feel there is a need for such a check on these machines? Liberty Utilities' proposed Granite Bridgepipeline project will be a 27 mile, 16-diameter, high pressure natural gas pipeline spanning state land along Route 101 between Manchester and Stratham. Its currently proposed route will run within 100s of feet of local water sources and could include crossing the Lamprey River twice in Raymond. Liberty Utilities also chose Epping to host a 200 billion cubic foot (160 feet high, 200 feet wide) liquified natural gas storage tank and a plant for reliquification and regasification to move from pipe to distribution. This May, the NH Senate passed HB1233. When signed into law, it will give the state full preemptive control over which seeds and fertilizers are allowed in NH. NHCRN educates our elected officials about our inherent and inalienable right to local self-determination. HB1233 violates this right and interferes with the people's collective authority to adopt ordinances concerning seeds and fertilizers that pose a threat to the health, safety, and welfare of NH's human and natural ecosystems. HB1233 supporters argue farmers need it to prevent patchwork laws interfering with farming from town to town. HB1233 opposition argues NH farmers and towns already work together well without issue, i.e. HB1233 is a problem in need of local democratic solutions. What could possibly be the silver lining in this preemption law coming to the Granite State? Especially considering we will be the 30th state in the nation to have such a law passed via the calculated agenda of big biotech companies and their shareholders, which include fossil fuel moguls? The silver lining is this. With every push against community rights, communities have reason to push back. NHCRN sees the Governor signing this bill as a call of action to NH communities to adopt local anti-GMO seed and anti-sludge rights-based ordinances--anyway. It is also a reminder call for NH communities to support the NH Community Rights Amendment because, with legislation like HB1233 blocking local democracy, our state officials and government have fallen short of protecting NH people and our communities and ecosystems. Democracy School explores the limits of conventional regulatory organizing and offers a new organizing model that helps citizens confront the usurpation by corporations of the rights of communities, people, and earth. Lectures cover the history of people’s movements and corporate power, and the dramatic organizing over the last decade in Pennsylvania, New Hampshire, Ohio, Colorado, Washington, and Oregon by communities confronting agribusiness, the oil and gas industry, corporate hegemony over worker rights, and others. Included with enrollment in the Democracy School is a 300 plus-page book of background reading material. Community Rights Organizing Webinar: Liberate Yourself from the Activist Hamster Wheel Only when we realize we are spinning in a fixed system can we begin to create new organizating strategies to work for what communities want, instead of compromising for what we don’t want. ADDITIONAL MEDIA OF INTEREST . . .
What's Up Eastie? -- Community Rights NHCRN President Michelle Sanborn and long-term East Boston community leader Mary Ellen Welch are interviewed about Community Rights by Kannan Thiruvengadam—an urban farmer, ecology enthusiast, community organizer, sustainability educator, climate resiliency consultant. community activist, and host of this Zumix radio show on current issues. Resistance Radio Derrick Jensen interviews CELDF’s Thomas Linzey on the legal structures that block us from protecting our communities and creating sustainability, why we keep participating in those structures, and what some communities are doing differently. Tell Me a Story: Michelle Holman, Activist Community Rights Lane County founder Michelle Holman talks to the Register-Guard about the importance of fighting for the health, safety, and welfare of Lane County residents. When Human Rights Are Not Enough: Defending the Rights of Nature Human rights to a healthy environment are gaining recognition—and today, the rights of nature are growing as well. Here, CELDF’s Mari Margil speaks to how recognizing ecosystem rights is central to tackling environmental degradation. Blog: The Gun Establishment's Weapon of Choice (Preemption) State involvement in the enforcement of preemption laws used to be a rare occurrence. What hasn’t been rare, unfortunately, is state legislators using preemption laws to shield large economic actors from municipal lawmaking. This gives private corporations an additional tool to sue municipal governments who “interfere” with the corporation’s activities. PGE Continues to Try to Bankrupt Grant Township We have done our research. We know of the dangers posed by fracking and fracking waste. We know that PGE has an awful record of environmental violations. We do not understand how we are the ones that could be punished when we are protecting our civil right to clean air, water, and soil. Restructuring Ohio State Government Ohioans have firsthand experience of the truth that the very legal and governing structures that we live under—regardless of the individuals in their corporate and government positions—are preventing us from governing ourselves and protecting our communities. Colorado Sits at Center of the Rights of Nature Debate Colorado environmentalists are gaining ground—and water—in their efforts to secure humanlike rights for nature. Informed Public Threatens Those in Power, But Our Public No Threat It is at our own peril that we do not understand why what’s happening in our country is happening. Nor do we understand how our system of government and law not only allows the why, but supports it. When we understand the “why,” we are a dangerous public to those in power. Not knowing the “why” makes us easier to control. Our Laws Make Slaves of Nature; It's Not Just Humans Who Need Rights Environmental laws regulate the human use and destruction of nature. They legalize fracking, drilling, and even dynamiting the tops off mountains to mine coal. The consequences are proving catastrophic: the die-off crisis of the world's coral reefs, accelerating species extinction, climate change. Finally, though, this is changing. A Phoenix From the Ashes: Resurrecting a Constitutional Right of Local, Community Self-Government in the Name of Environmental Sustainability This article began as a series of legal briefs filed in various federal courts in defense of several municipal communities who had asserted their local legislative authority to prohibit a variety of harmful corporate projects. Voters Want Local Control, Not State Takeovers Pushing back against preemption is not just a matter of winning elections. People who feel disenfranchised by what they see as a corrupt, centralized power structure aren’t looking for the next elected official to save the day. They want to save their own day. How American Corporations Had a 'Hidden' Civil Rights MovementLaw professor Adam Winkler says that in the past 200 years, businesses have gone to court claiming constitutional rights that were originally intended for people. His new book is We the Corporations. Support Community Rights with a donation — THANK YOU! Copyright © 2018 New Hampshire Community Rights Network (NHCRN), All rights reserved. You are receiving this email because you joined our mailing list by signing up for it in one of several ways. We'd like to thank you for your support! If you want something done, do it with your community. Forty-four years ago, this sentiment rallied Durham residents who protected the Great Bay estuary system from oil refinery development. It’s also one of the sentiments that brought together Alliance for Newmarket Citizen & Ecosystem Rights. ANCER is an ad hoc community group founded in 2017 to empower Newmarket’s residents to protect their water and the Great Bay estuary from future chemical trespass. But the estuary has already been contaminated by toxic Naval firefighting foam from Portsmouth’s former Pease Air Force Base and by chemicals traveling down tributaries affected by Greenland’s Coakley Landfill. So why try preventing what’s already happened? Because new threats loom over the estuary and Newmarket’s Lamprey River watershed. Firstly, word is that Pinard Waste Management hopes to transition its Raymond recycling transfer station — approved on the Lamprey near a flood zone — into a solid waste transfer station. Secondly, Liberty Utility has planned its Granite Bridge Pipeline project to twice cross the Lamprey in Raymond. Finally, Eversource’s Seacoast Reliability Project will drill through Little Bay to create a power passage with towering transmission poles alongside the estuary. Eversource’s project troubles ANCER members and Durham and Newington residents for a number of reasons. For one, its drilling would cause irreparable harm to the estuary’s fragile, recovering oyster bed ecosystem by stirring up 100s of years of toxic industry run-off that has settled and been contained in the bay’s sediment. The documentary Great Bay: Estuary in Peril details this damage Eversource’s “reliability” project would cause. Nonetheless, this February, the NH Dept. of Environmental Services recommended Eversource’s project to the Site Evaluation Committee in a “lesser evil” buried version to be worked on with “safer” drills than originally proposed — yet still chemically trespassing into the estuary. NHDES scientists may mean well, but they work in a system designed as a one-stop shop for corporate project applications; in other words, state permitting agencies find ways to at best limit rather than block harm so that applications move forward — they permit harmful projects. In response, and with assistance from Community Environmental Legal Defense Fund (CELDF), ANCER is organizing a community citizens’ effort to bring forth a rights-based ordinance (RBO) to protect Newmarket’s residents, watershed, and waterways by banning future chemical trespass as a matter of inherent and inalienable rights of people and ecosystems to exist without being poisoned, thereby protecting the Great Bay and surrounding water. Newmarket would not be the first New Hampshire town to adopt an RBO — some 11 New Hampshire towns adopted RBOs after recognizing that the current structure of law and government is set up to protect neither them nor the environment and that the only remedy left is to protect themselves locally. Consequently, RBOs are based on the collective power of community members exercising their individual right to democratically manifest the social and environmental health and viability they envision for their human residents and surrounding ecosystems. ANCER encourages other towns on and near the estuary and its tributaries to adopt RBOs of their own, creating a powerful ring of democratic, common sense, and constitutional community ordinances that corporations will have to face if their projects threaten Seacoast water and the human and natural communities depending on it. In fact, ANCER is part of a statewide local democracy movement working to amend New Hampshire’s Bill of Rights to recognize the right of local self-government in order to empower New Hampshire communities to make local governing decisions that elevate the rights of people and ecosystems above the right that corporations have to harm them. This 2018, NH Community Rights Network (NHCRN) worked with bi-partisan legislative support to propose such a state constitutional amendment. One third of the N.H. House supported the amendment and the right of NH residents to protect people and ecosystems in the face of corporate harm. To learn more, visit www.nhcommunityrights.org, or email info@nhcommunityrights.org. The legislative subcommittee studying CACR 19 supported (3-2) bringing this constitutional amendment to the people for a vote, but the House Municipal and County Government Committee will recommend (11-8) the House not allow us that opportunity. I better understand how difficult our legislators’ jobs are and how little time they have to really understand complex issues. Did committee members favor the authoritarian model of government, under the influence of money and lobbyists, or moving toward a more mature (and yes, messy) democratic decision-making process that includes ordinary citizens? Rep. Vincent Migliore, R-Bridgewater, chose not to “succumb to fear and doubt” and extensively researched to understand the proposed amendment before signing on in support. He had confidence citizens can do the same. What would this amendment do? It codifies the constitutional right we already have to protect the health, safety and welfare of our communities against corporate harms and their court-bestowed personhood “rights.” Under the current interpretation of courts, those rights trump the civil and political rights of real people trying to protect our communities. That is not what my 12 Revolutionary War ancestors fought for and it is not what our elected officials take an oath to protect. A sincere thank you to Rep. Bruce Tatro from Swanzey and Rep. David Meader from Keene, who listened to their constituents as well as the two opposing views. I hope more citizens will do their own research. Why were the gun lobby and Americans for Prosperity (funded by the Koch brothers) opposed? Why did 600 New Hampshire citizens sign a petition supporting it and so many of us travel to Concord more than once to watch “our” government at work? Contact www.nhcommunityrights.org to begin educating yourselves and become part of the conversation at the local level. The state House has again rejected a bid to give New Hampshire towns more control over their own environmental protections – but advocates of the constitutional amendment say they're making progress. Organizer Michelle Sanborn with the Community Environmental Legal Defense Fund says the House barely debated the proposal the first time around, in 2016. So she's encouraged by Thursday’s House vote of 271 to 112 against it. "One third of the House supported elevating the right of New Hampshire people... basically to pass laws protecting health, safety and welfare of individuals but also their communities and natural environments above corporate activities that harm them,” she says. As in most states, New Hampshire's legislature must grant towns all their governing powers – a system known as Dillon's Rule. Opponents say the amendment would create too much of the opposite, known as home rule, which allows more local freedom to govern. Sanborn says this year's debate already has more towns interested in passing their own environmental laws, to protect against big energy developments or water quality threats. The amendment would help those laws stand up in court. She says she was also pleased to have support this year from legislators outside of towns affected by issues the amendment addresses. Her organization hopes to campaign for the amendment again next year. They say it’s the first community rights constitutional amendment to reach a state legislature. "If we've learned anything from prior people's movements, it's that fundamental change comes from persistent, unrelenting pressure," Sanborn says. The legislature isn't their only option to push the proposal in New Hampshire. Every 10 years, the state votes on whether to hold an open constitutional convention. It's happened just five times since 1793, and comes up next in 2022. MUNICIPAL AND COUNTY GOVERNMENT CACR 19, relating to right to govern. Providing that the people of the state may enact local laws that protect health, safety and welfare. Rep. Franklin Sterling for the Majority of Municipal and County Government. This amendment is an attempt to change the NH Constitution and permit “Home Rule” giving veto power to any community in area wide projects. Passage of this amendment would allow one community to forbid a highway construction or expansion in their community although the surrounding communities desired it. When Planning Boards consider projects with “regional impact” they consult neighboring communities that will be affected. This amendment would render that purpose impractical since a community would no longer need to consider how a project would affect their neighbors. The philosophy behind this Constitutional Amendment could be extended to neighborhoods within a community pitting one neighborhood against another. The result would be discord and dissatisfaction with no overall state control or influence. The effect might be different rules from community to community relating to leash laws, taxi cabs, highway uses with different weight limits, municipal sales taxes, firearm controls and a myriad of other quality of life provisions guaranteed to us by the state. Vote 11-8. ​Rep. Steven Rand for the Minority of Municipal and County Government. This constitutional amendment adds a new article (40) to the Bill of Rights of the NH State Constitution. The article makes plain that communities may enact local ordinances that protect the “health, safety and welfare” (a well understood phrase used in 151 NH statutes) of their local citizens and of nature. At the same time, it does NOT allow the establishment of ordinances that would remove or weaken any existing protections or rights of natural persons currently secured by local, state or federal law (such as second amendment rights). We heard testimony from many NH communities who wished to limit or deny a corporate wind, water, or contaminant project only to find that they did not have the constitutional standing to prevail against the constitutional “personhood” civil rights of a corporation in a court of law. The corporation’s financial resources and constitutional civil rights made for an unfair fight in the courts. This amendment levels the playing field. Because this amendment’s purpose is to recognize limited constitutional power to communities, it will, within its purview, make a substantive change to the parent-child relationship of the State to cities and towns. Within narrow limits, it gives towns the flexibility to address matters of local concern without needing state enabling legislation. The minority believes that this substantive matter must be decided by the people themselves as the ultimate stakeholders in our system of government, through the popular vote of the amendment process. As we proceed toward a vote on the amendment, citizens should and will take the time to educate themselves and decide their best interests on this balance of power/rights-based question. It is our obligation as their representatives, to pass the amendment so they can learn, decide and vote. to hold signs and hand out CACR19 flyers to Reps as they enter the Hall for session. Use the NH Community Rights Amendment FAQ to help personalize your message and prepare you for questions Reps may have. If you aren't sure how to answer a question, please ask if you can get back to them on it. Then email the question to NHCRN for a response to share with the representative. "I encourage you to support placing the NH Community Rights Amendment CACR19 on the November ballot for a democratic vote by the People. The need for a state constitutional amendment securing and protecting the Right of Local Community Self-Government is obvious. Today, the law elevates rights of private corporations over the rights of people who live in New Hampshire communities. Private corporations regularly invoke these rights and privileges when their interests conflict with the communities' attempts to protect local health, safety and welfare. CACR19 protects the rights of real people in New Hampshire over the interests of private corporations. Vote NO ITL on CACR19." "I ask you to support the NH Community Rights Amendment CACR19, which empowers our communities with local governing authority to protect our health, safety and welfare along with the air we breathe, the water we drink, and the soil we grow our food in. The NH Community Rights Amendment makes clear that people and municipalities can only use their lawmaking power to enact local laws that create greater protections for people, communities, and nature, NOT to restrict or weaken fundamental rights. Protect the people and natural resources of New Hampshire by voting in favor of placing CACR19 on the November ballot. Vote NO ITL on CACR19." "I encourage you to support the NH Community Rights Amendment CACR19 because it is the activities of corporations, not the rights of people that the state holds authority to regulate. Rights of natural people must come first. It is the right of people to govern the activities of corporations that are chartered in the "name of the people". It is unjust for the state to place governance of corporate behavior beyond the people, limiting the use of local governments by the citizens. The people have an inherent and unalienable right of self-government in the communities where they live, including authority to govern the behavior of business activities. Support local control and vote NO ITL on CACR19." CACR19 empowers people in their communities to protect community interests over profit. CACR19 addresses this inequality by seeking to recognize, secure, & protect the individual & political right & authority of people in NH municipalities to enact local rights-based laws that prohibit corporate activites violating their rights to the health, safety, & welfare of their human communities & the air, water, & soil on which they depend. CACR19 recognizes local authority to protect health, safety, & welfare as a matter of right. CACR19’s language ensures local rights-based laws could not weaken real persons’ existing rights—including 2nd Amendment rights—under state & federal constitution & law, but could be used only to expand rights. 2008 & 2010 U.S. Supreme Court precedents declared 2ndAmendment rights are individual constitutional rights & consequently protected by CACR19’s language. CACR19 recognizes authority to protect & expand individual rights. Rights are not gifted by but recognized & enumerated within constitutions, so CACR19 is not a proposed law but a proposed constitutional amendment seeking to enumerate the right of local community self-government within NH’s Constitution the same way freed slaves' equal rights were recognized within the U.S. Constitution. CACR19 recognizes limited local control at the municipal level. Empower your constituents with the opportunity to decide on November’s ballot if they want a recognized right to protect people, places, & principles over profit. Thank you to the eight House Municipal and County Government Committee members who voted in support of CACR 19 two weeks ago. The Constitutional Amendment for Community Rights will provide municipalities with the opportunity to determine what development they want for their communities, and among other protections, allow towns to protect the natural resources that support the people who live in them. Rep. Vincent Migliore (R-Grafton) took the time and effort to study the proposed amendment to understand its benefit to N.H. residents and Rep. Clyde Carson (D-Merrimack) stated it would give communities equal footing with large corporations. It was unfortunate that the committee chairman would not allow the subcommittee to provide their findings prior to the executive vote on the amendment. It is unfortunate many of the members lack an understanding of community rights, or are fearful of providing N.H. voters a choice to decide for themselves what is best for their communities. You can learn more about the NH Community Rights Network at www.nhcommunityrights.org. ASHLAND — The Northern Pass hydroelectric project, like the prospect of wind towers on area mountaintops, has fueled an interest in rights-based ordinances, which empower communities to set limits on development that residents feel would adversely impact their health, safety, and welfare. Whether such ordinances are legal in New Hampshire is an open question that has yet to be tested in court. A proposed constitutional amendment would settle the question by inserting the right to local self-government into the New Hampshire Constitution. Plymouth recently adopted a rights-based ordinance, and Ashland has a petitioned RBO article on the Town Meeting ballot, both aimed at stopping projects like Northern Pass. Opponents of the ordinance point to the denial of Eversource’s application for a permit from the state’s Site Evaluation Committee as evidence that the current system works, and say a rights-based ordinance can have unintended consequences and potentially pit towns and neighbors against one another. Similarly, a House committee that heard testimony on Constitutional Amendment Concurrent Resolution 19, that would recognize RBOs, has deemed it inexpedient to legislate, which would effectively kill it instead of forwarding it on to voters for a decision. Even without constitutional protection, rights-based ordinances are effective in fighting “corporate personhood” — the view that companies such as Eversource have a right to do what they wish, where they wish — according to Michelle Sanborn of Alexandria, who serves as president and coordinator of the New Hampshire Community Rights Network and represents the Community Environmental Legal Defense Fund. Since persuading her town to adopt an RBO, she has assisted residents of other communities, including Ashland, in drafting their own rights-based ordinances. Sanborn said Ashland would be the 12th community in the state to adopt an RBO. There are almost 200 such ordinances across the nation, she said. She noted that Nottingham has held off USA Springs and its investors for 10 years after enacting an RBO. The company had gone through the standard regulatory process and was ready to tap into the town’s aquifer when passage of an RBO stopped the process. Her own town of Alexandria, along with other Newfound/Mount Cardigan towns, has used RBOs to hold off industrial wind projects for the past four years. Each ordinance can be crafted to meet that particular community’s needs, Sanborn said. Ashland’s would prohibit land acquisition for “unsustainable” energy systems, defined in the ordinance as energy systems controlled by state and federal energy policies, rather than community policies; industrial-scale water and wind power that is not municipally owned and operated; and non-renewable energy sources or those that produce toxins or substances that are injurious to humans or ecosystems. The ordinance provides exceptions for non-commercial energy produced for on-site use. One of the problems some people have with the ordinance is that, since state and federal government regulates virtually all power, the ordinance effectively defines any power source as “unsustainable” unless it is used on-site. There is an exception for utility companies operating under contract with the town, and those previously operating in Ashland. Other provisions of Ashland’s ordinance ban toxic waste disposal and exploratory data collection, engineering and geotechnical work associated with an unsustainable energy system. Sanborn said the ordinance does not require the town to enforce its provisions if the community decides it desires a particular energy project. “What the RBO does is give the community a decision-making seat at the table, as a matter of right, that they do not currently have through any state regulatory process,” she said. The idea behind rights-based ordinances is that both the United States and New Hampshire constitutions assert the right of self-government, but New Hampshire law operates on a top-down basis, saying that any municipal rights derive from enabling legislation by the state. Local control is a myth under such a system. Corporations are able to navigate through the laws and regulations to achieve what they desire, and towns and cities can only impose restrictions. If a town wants to stop a project, it has to rely on the courts. A rights-based ordinance bypasses the judicial system by bringing the decision to the local level. During hearings in Concord on CACR 19, which asserts that, “All government of right originates from the people, is founded in their consent, and instituted for the general good,” the constitutional amendment faced opposition from legislators who reminded speakers that New Hampshire is not a home rule state. Having a 400-member House of Representatives ensures that people have an adequate voice in setting policy, they said. Passing the amendment would give rights-based ordinance legal status, allowing people to challenge development that they believe would adversely affect their town. It would take the approval process out of the regulatory arena and make it a constitutional matter, proponents said. Should the legislature pass the amendment, it still would have to be approved by two-thirds of the state’s residents. A subcommittee voted, 3-2, to recommend passage of the bill, but when it went before the full Municipal and County Government Committee, Vice Chairman Franklin Sterling moved to label it as inexpedient to legislate. Rep. Steve Rand (D-Plymouth) objected because the committee had not had a chance to offer its recommendation, but the chairman allowed the motion, leading to an 11-8 vote to “ITL it,” according to Vincent Paul Migliore (R-Bridgewater), a sponsor of the bill, who was the only Republican to support the measure. The bill was on the agenda for action by the full House on March 7 before that body recessed early because of the snowstorm. It is scheduled for action when the House reconvenes on March 15. The House calendar states both the majority opinion and the minority view. Sanborn commented, “Almost a dozen towns over the past decade have enacted RBOs because the right of local, community self-government is an inherent and unalienable right expressed within the Declaration of Independence and carried over into state constitutions. If CACR 19 is not approved by the House to move to the Senate, then people are being denied the right to amend their own Bill of Rights, but that hasn’t stopped any towns so far and, if anything, it will inspire more towns to enact RBOs to correct the balance of power. We, the people, far outnumber “them”, the corporations. While individuals may not have the financial clout of corporations, we have the right to our health, well being, and safety — none of which are possible without clean air and water, healthy, productive agricultural soils, scenic beauty, and other assets increasingly threatened by overreaching wealthy corporations. Your support of the NH Community Rights Amendment CACR19 may not line the pockets of powerful corporations. But the rewards will come in the form of healthier children, abundant natural resources, and the kind of communities that attract business and tourists to beautiful New Hampshire. CACR19 will empower our communities with local governing authority to preserve these immeasurable assets while maintaining all of our existing fundamental rights, including the right to bear arms. This bill is not a taking, but a giving back. Please uphold your vow to represent “we, the people” by voting "NO ITL" on CACR19, so that we may get this important community rights amendment on the November ballot for the people to decide. We are calling for bipartisanship solidarity to recognize New Hampshire citizens’ right to self-government that CACR19 seeks to codify as it goes to New Hampshire House debate and vote this week. Granite State citizens have asked for CACR 19 to recognize and protect in New Hampshire’s Bill of Rights the authority of New Hampshire communities to enact local laws by majority vote to ban harmful corporate projects in order to protect NH citizens and the air, water, and soil on which they depend—so long as local laws wouldn’t limit existing state and constitutional rights of natural persons. In short, CACR 19 addresses inequality. New Hampshire citizens have neither binding voice nor equal standing against harmful corporate activities and “personhood” that consistently appeal to state preemption to remove any recourse New Hampshire citizens have to prevent their communities and ecosystems from becoming sacrifice zones to profit marketed as a “greater good”. CACR 19′s 9 bi-partisan sponsors, including 2 Republican NRA members, understand that the language of the amendment ensures that local rights-based laws could not weaken real persons’ existing rights—including 2nd Amendment rights—under state and federal constitution and law but could be used only to expand rights. Moreover, 2008 and 2010 U.S. Supreme Court precedents declared that 2nd Amendment rights are individual constitutional rights, which are protected by CACR 19′s language. Because rights are not gifted by but recognized and enumerated within constitutions, CACR19 is not a proposed law but a proposed constitutional amendment seeking to enumerate the right of local community self-government within New Hampshire’s Constitution the same way freed slaves’ equal rights were recognized within the U.S. Constitution. If CACR 19 passes through both New Hampshire’s House and Senate with 3/5 votes, then New Hampshire’s people get to decide if they want the right to elevate and protect people and planet over profit. A 2/3 vote by New Hampshire citizens would codify this right in New Hampshire’s Bill of Rights. The Revolutionaries of this country fought for something intangible but rich—the right to pursue a self-determined life of honesty and goodness. For our legislators to deny us an enlightened, democratic, constitutional path to access this self-determination is to admit their doubt in their constituents’ ability to understand, trust in, and make decisions in the best interest of the goodness in ourselves and in the ecosystems around us. CACR19 will secure our right to protect this goodness for a new future honoring people’s and nature’s natural right to sustainability. 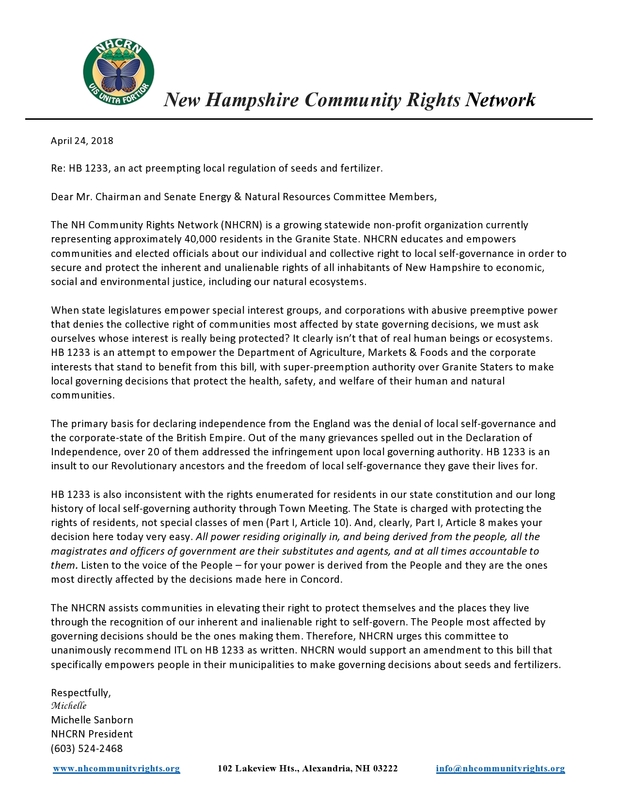 As NH Community Rights Network (NHCRN) board members, we support CACR 19′s effort to amend our NH Bill of Rights to recognize the individual and collective right of local self-governance in order to secure and protect the inherent and unalienable rights of all NH inhabitants to economic, social, and environmental justice. This week, we hope New Hampshire representatives vote in support of CACR 19 by voting NO on the current inexpedient-to-legislate (ITL) recommendation for CACR 19. Overturning ITL on CACR 19 would give the House the chance to vote that CACR19 ought-to-pass (OTP), sending it on to the Senate, and hopefully to New Hampshire citizens. Learn how you can support protecting people, places, and principle over profit by contacting info@nhcommunityrights.org or visiting www.nhcommunityrights.org. — Douglas Darrell is from Center Barnstead and Monica Christofili lives in Newmarket. On Feb. 27, the N.H. House's Municipal and County Government Committee met to determine what to do with proposed Constitutional Amendment Concurrent Resolution 19 (CACR19), "related to the right to govern, PROVIDING THAT: the people of the state may enact local laws that protect health, safety and welfare." CACR19 had already been discussed at prior subcommittee work sessions. A resulting 3-2 vote prompted a recommendation to the full committee that CACR19 "ought to pass," bringing it one step closer to allowing the public to vote on the proposed amendment. Unfortunately, the panel voted 11-8 to recommend deeming CACR19 "inexpedient to legislate." In a growing chaotic atmosphere, various members of the committee in bold opposition to CACR19 stressed claims of: loss of individual rights; the fear of competing regulations across the state; and that the N.H. Constitution gives power to representatives, not the public. Some reps vehemently insisted that supporting the recommended ought-to-pass tag would lead to chaos and total anarchy. On the contrary, the proposed amendment is clear: "Local laws adopted pursuant to this article shall not weaken existing protections, or constrict the fundamental rights of, natural persons, or their local communities, or nature, as those protections are secured by local, state, federal or international law." Thanks to Swanzey Rep. Bruce Tatro and Keene's David Meader for their support. Tatro and Meader, along with Reps. Vincent Migliore and Steven Rand (both cosponsors of CACR19), were among the eight lawmakers favoring encouraging the people to "educate themselves" and "let the people decide" what they want. The latter was enough to convince Rep. Susan Treleaven to change her vote to support "ought to pass." The N.H. Constitution, Article 8, notes: "All power residing originally in, and being derived from the people ..." confirming final decisions should be made by the voters. Let us get started exercising that right in our own communities. Rep. Rand reminded everyone, "Each legislator took an oath. The people are the authority; we are their representatives." Follow CACR19's progress at: www.nhcommunityrights.org, then contact your representative and share your opinion. I am concerned by the underhanded treatment NH Community Rights Amendment, CACR19, received during its Feb. 27 House Municipal & County Government executive session. At CACR19’s original hearing on Feb. 6 , I testified as a mother and Alliance for Newmarket Citizen & Ecosystem Rights member determined to say an effectively resounding NO to projects that would contaminate the water my son drinks. CACR19 was proposed to recognize and protect in our NH Bill of Rights the authority of N.H. communities to enact local laws by majority vote in order to protect themselves (and the air, water, and soil on which they depend) from harmful corporate projects — as long as local laws wouldn’t limit existing state and constitutional rights of natural persons. CACR19’s nine bi-partisan sponsors — including two Republican NRA members — believe CACR19 is needed because N.H. citizens currently have neither binding voice nor equal standing against harmful corporate interests that consistently and unfairly appeal to state preemption to take away any real recourse citizens have to prevent their communities from becoming sacrifice zones to profit marketed as “greater good” for the larger state. After its initial hearing, I watched CACR19 move through Feb. 13 and 14 subcommittee work sessions resulting in a 3-2 bi-partisan vote recommending that it ought to pass. The next step was CACR19’s executive session where protocol would have the full House Municipal & Government committee chair open by calling the subcommittee chair to report to the full committee the outcome and reasoning behind this ought-to-pass recommendation. Not only was this protocol not followed at CACR19’s Feb. 27 executive session, but the senior Republican chair of the full committee ignored the first hand that went up. It belonged to a CACR19-supporting Republican subcommittee member seeking to motion that CACR19 ought to pass as recommended. The full committee chair looked at him, looked away, and instead called on the subcommittee chair — a fellow senior Republican voting against CACR19 who not only neglected reporting the ought-to-pass subcommittee recommendation vote but also immediately motioned that CACR19 be inexpedient to legislate. This subcommittee chair should have reported on and motioned that CACR19 ought to pass so that it could be seconded and voted on by the full committee. If it did not garner majority support as such, then it could have been motioned inexpedient to legislate, seconded, and voted on accordingly. Point of order was called to have the inappropriate inexpedient to legislate motion withdrawn, but to no effect. This prompted additional protest from six bi-partisan committee members — one of whom is registering formal objection, all of which decreased their time to actually discuss CACR19. Meanwhile, representatives opposing CACR19 ignored the amendment’s language, which clearly states local laws protected under the amendment would go through town majority vote procedures and would not limit but expand citizen rights. They hyperbolically characterized the amendment as a harbinger of anarchy and chaos. The only approach to anarchy I see associated with CACR19 is that of senior committee members believing their opinions supersede the process deserved by each piece of legislation that comes before them. Ultimately, the vote tallied 11-8 in favor of recommending to the full N.H. House that CACR19 be inexpedient to legislate (one absent representative supporting CACR19 would have made it 11-9). Sometime next month, CACR19 heads to the N.H. House floor and anticipated heated debate to overturn the committee recommendation of inexpedient to legislate. I urge N.H. voters to visit www.nhcommunityrights.org to learn more about CACR19 and to call their representatives to ask them to support the amendment. The NRA's New Hampshire chapter--the Gun Owners of NH--has attacked the NH Community Rights Amendment with an anti-CACR19 action alert on its website and a letter to the Municipal & County Government committee. The right of local community self-government includes the right to a system of government within local communities that, one, is controlled by community majority and that, two, secures and protects the civil and political rights of every person in the community. It also includes, three, the right to alter or abolish the system of local government if it infringes on the prior two components. TAKE AWAY: Any majority-voted community self-government law would be limited by people's civil and political rights, i.e. laws adopted under CACR19 could not infringe upon the right to bear arms and could only expand, not lessen, people's rights secured by local, state, and federal constitutions. Republican NRA members and sponsors of CACR19 have consistently directed naysayers to study CACR19's language: "Local laws adopted pursuant to this article shall not weaken existing protections for, or constrict the fundamental rights of, natural persons, or their local communities, or nature, as those protections and rights are secured by local, state, federal, or international law." TAKE AWAY: CACR19 would PROTECT rights for natural persons--including Second Amendment rights--already recognized in state and federal constitutions. In 2008 and 2010 cases, the U.S. Supreme Court declared that Second Amendment rights are individual constitutional rights and consequentlyoverturned local firearm restrictions as violations of these rights. TAKE AWAY: U.S. Supreme Court precedent holds that CACR19 would not protect local laws attempting to restrict Second Amendment rights.